Kiwiana in the New Zealand art world now refers to more than just appropriated or recycled images of mid twentieth century kitsch kiwi icons like plastic Watties tomato sauce bottles and buzzy bees. The term kiwiana (note loss of capitalisation) seems to be gaining a looser and consequently more broad meaning in everyday usage, at least in our part of the New Zealand art industry. We first noticed this when picture framers and gallery owners would ask us if we had any new kiwiana images - and they were meaning prints by contemporary NZ painters like Grahame Sydney rather than art prints of iconic Kiwiana (for example a picture of a pavlova topped with kiwifruit). Our picture framers and gallery owners were using kiwiana as an instinctive shorthand to easily describe and convey that they wanted "not imported" art. In particular kiwiana was being used to describe typically NZ pakeha art rather than indigenous New Zealand Maori art and design like Kowhaiwhai. A Kiwiana definition for non-New Zealanders reading NZ Art Print News: Kiwi are the flightless bird that is one of New Zealand's national emblems and also the nickname that most New Zealanders would be comfortable using to refer to their own nationality alongside the more formal "New Zealander" when speaking to others. The "ana" suffix is commonly affixed to words to show that the items in question are representative of or a collection of items or representative/associated with the term - the first usage of the word Kiwiana is not known but its initial coinage must have a derivation owing at least in part to a very similar word used describe domestically designed and created art from the United States "Americana". It has been an interesting process curating the Kiwiana collection because we quickly found that there are some pictures that just seem to fit in this new collection without any argument - whereas a picture of a famous geographical NZ icons such as Mt Cook or Rangitoto or even New Zealand's favourite painting of Cass by Rita Angus just don't seem to qualify as kiwiana. From this experience it seems we know "Kiwiana art" when we see it even if trying to define it in the abstract is difficult. Does a natural icon like Mt Cook/Aoraki have to be re-interpreted by an artist or be translated into a logo or brand to become Kiwiana? Or is kiwiana (this writer has to consider each time whether to capitalise the initial K or not which is perhaps indicative of the fluidity in breadth of the meaning of the word) broad enough to include any image that is collectively famous for nearly all New Zealanders but not people from other countries (eg Four Square store's Four Square Man), or Charles Goldie's Maori portrait known as a Good Joke and perhaps extending to a scene that is so widely reproduced it has become a visual cliche (Mitre Peak in Milford Sound) even if it is painted in divergent styles by different artists. 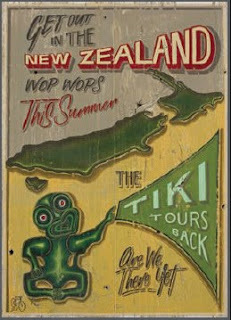 Lester Hall has some great kiwiana giclee prints.